Hibernian edged back into the top six thanks to a late strike from Steven Fletcher at New Douglas Park. With 10 minutes remaining, Derek Riordan sent a teasing ball across the face of goal and Fletcher rammed it in from close range. 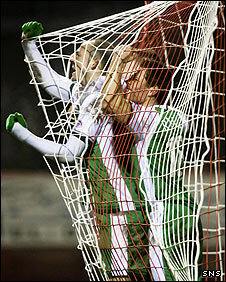 The home side had been lively in the early stages but Hibs created the better chances and grew in confidence. Alan O'Brien and Colin Nish both squandered opportunities, as did Fletcher before he made amends. Hibernian have taken nine points from nine against the Accies, without conceding a goal to the promoted Lanarkshire side. And the victory will ease the pressure on under-fire manager Mixu Paatelainen after a sequence of disappointing results. James McCarthy was at the hub of Hamilton's promising start. The teenager outpaced Hibs right-back Darren McCormack but Grzegorz Szamotulski caught his attempted cutback. The Accies midfielder later shot narrowly wide from 20 yards after a long throw was only half-cleared by the hesitant Hibs defence. Paul McGowan's deflected cross then clipped the crossbar after the visitors failed to deal with a long free-kick into their penalty area. Hibs were finding it hard to get their forwards involved and defender Chris Hogg tried his luck with a long range strike which flew narrowly over the crossbar. The hosts soon reasserted their dominance, with James Gibson's powerful drive saved and David Elebert awkwardly hooked over with his back to goal. Accies striker Kenny Deuchar met a Simon Mensing head flick on 38 minutes but the his half-volley drifted just wide, with Szamotulski scrambling. Moments before the interval, Hibs almost snatched the opener on the counter-attack, with O'Brien stabbing Nish's return pass inches wide at full stretch. The visitors were the brighter side after the break and John Rankin expertly skipped past a challenge to pick out Nish with a perfect cross, only for the striker to balloon his header over the top when a goal looked certain. A moment later, Fletcher blazed wide from a promising position as the Accies defence was posted missing from a clever Denes Rosa pass. The Hibs striker looked short of confidence with only keeper Tomas Cerny to beat but posed more menace when he fizzed in a powerful dig from distance a few minutes later. And the 21-year-old Scotland international was smiling when he claimed his first goal since November on 80 minutes. Riordan did well to swivel and send a raking delivery across goal and Fletcher was on hand to slam a shot into the middle of the net from six yards out. The lively Riordan then set up Nish for a shot on the angle which was comfortably saved by Cerny. "It looked like being a stalemate because there were not too many chances. "We started well and shaded first half. Over the 90 minutes I think we should have had a point. "Sometimes a team gets the Indian sign over you and it's incredible given the chances we've created against Hibs this season. "We had to make four key changes due to injuries and the effort from my players was fantastic." "There's always pressure on players and managers to produce results and I'm delighted for the boys because the spirit and determination was there. "In the second half we created a number of openings and good build up play led to an easy tap-in for Fletcher. "We know what the team can do, we just need to produce the goods on a more consistent basis." Hamilton Accies : Cerny, McMillan, Elebert, Swailes, Gibson, Easton, Neil, McArthur (Lyle 81), Mensing, McGowan (Quinn 76), Deuchar (Offiong 65). Subs Not Used: Murdoch, Thomas, Kirkpatrick, Evans. Hibernian : Szamotulski, McCormack (Thicot 56), Hogg, Bamba, Stevenson, Rankin, Rosa, O'Brien (Chisholm 90), Riordan, Nish, Fletcher. Subs Not Used: Ma-Kalambay, Yantorno, Keenan, Campbell, Johansson. Booked : Rosa, Stevenson, Rankin, Nish.